I don’t care that all of Singer’s reworked 911s all look the same. I would buy one in a heartbeat if I got some massive windfall of money. 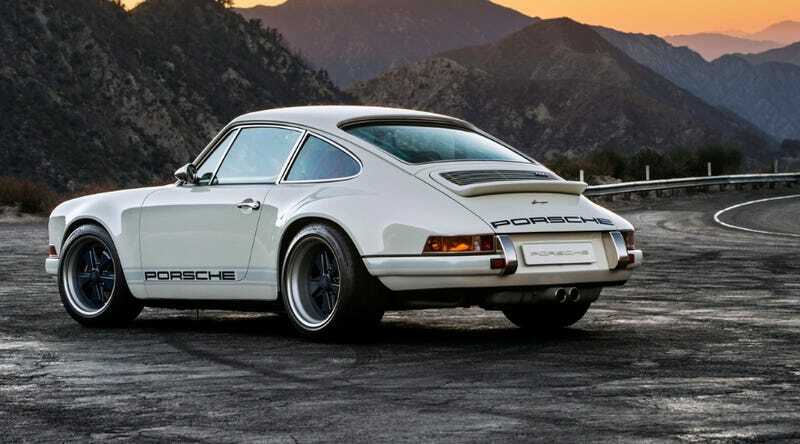 And for the Goodwood Festival of Speed, Singer has a new addition called the “Newcastle” that is both gorgeous and wicked fast. This car is a right-hand-drive 1990 964 and of course, every inch of it was painstakingly restored and improved. The motor was replaced with a 4.0-liter flat six that pumps out 390 horsepower and 315 lb-ft of torque. All that power in such a small car is good for a 0-60 run in a stunning 3.3 seconds. The exterior is appropriately called Singer Racing White and accented by dark blue accents and light blue shadow stripes. The Fuchs wheels are painted in a matching blue hue. The blue theme continues on the interior and while the inside is simple, Singer understands that less is more when it comes to your vintage style sports car. They give you everything you need and nothing you don’t. Word on the street is that friend of Jalopnik and Top Gear host Chris Harris will drive this very car at the event. As if you needed one more reason to be jealous of that man. Since you probably can’t buy it or drive it, just sit back and dream at these wonderful images.